What is Behind The Falling Rupee? The foreign currency markets around the world are much like the markets for any other goods. If the supply of rupees rises relative to its demand, then the price of it will fall. And it has been falling for many years! It took 7.50 rupees to buy one US dollar in 1970, but it took 52 rupees in the first week of March 2009 ' 593.33 percent decline in nearly 39 years or 15.6 percent a year! If the demand for rupees rises relative to its supply, then the price of it will rise. This happened very briefly from mid 2007 to mid 2008 when the overseas demand for Indian software services rose among other things; it gained strength against the US dollar and hovered between 38 to 42 rupees per US dollar compared to 48 rupees in early 2007 and 49 rupees in late 2008. Why is the rupee falling now? The RBI can use monetary policy two ways: one way is to defend the rupee against the foreign currency and second to stabilize or to improve the domestic economic conditions. If the goal of RBI is to defend the rupee then it could directly intervene in the foreign exchange market. It would sell major currencies like dollars, euros, pounds, or yens in open market and buy rupees. Generally, this kind of intervention would be coordinated with other central banks, which would also buy rupees. This action would cause rupees to go up in price. However, RBI has hardly ever intervened in the currency market. Presently, RBI has lowered interest rates, a monetary policy tool, not to address the problem of the falling rupee, but to address the nation's falling economic growth. But, this action is actually working against the rupee in the foreign exchange market. And here is what's happening. RBI has cut its lending rate (called repo rate) to banks at 5 percent. It has also lowered the rate (called reverse repo rate) at which it borrows from banks to 3.5 percent. It is encouraging the public as well as companies to borrow money from banks and buy goods and services to help spur the economic growth. They are sending the message that rupees are available at a lower interest rate for someone to borrow. Yes, rupees are available but the companies involved in exporting their goods and services are in no mood to expand their businesses because economies of the USA and countries in Europe and other places are in bad shape. The 52 rupees to a dollar rate should make it very attractive for foreign buyers to buy Indian goods and services, but foreigners are broke. So, there is no demand for rupees and the excess rupees are floating in the Indian economy. Yes, rupees are available and the 52 rupees to a dollar rate should make it very attractive for foreign visitors to buy rupees and visit India, but foreigners are broke and can't afford to travel. Those foreign travelers who could travel are worried about the safety in India; the terrorists' incident in Mumbai is still fresh in their mind. So, there is no demand for rupees and excess rupees are floating in the Indian economy. Yes, rupees are available and the 52 rupees to a dollar rate should make it very attractive for foreign investors to buy rupees and invest in Indian companies but foreigners are broke and can't afford to invest. Those investors who could invest are likely to wait and see which party comes to power after the general election in May 2009. Also, Indian companies' stocks aren't performing well like many companies around the globe. So, there is no demand for rupees and excess rupees are floating in the Indian economy. Yes, rupees are available and the 52 rupees to a dollar rate should make it very attractive for foreign investors to buy rupees and park their money in the Indian banks but foreigners are broke and can's afford to invest. Also, interest rates offered by Indian banks are not that attractive. So, there is no demand for rupees and excess rupees are floating in the Indian economy. 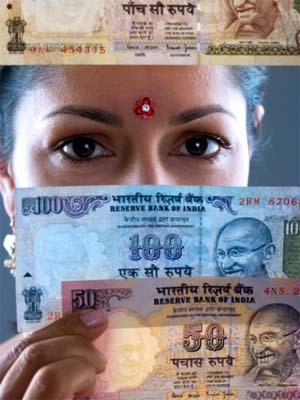 Multinational companies convert their earning from rupees to the currency of the country they come from. And when the rupee keeps falling, they are in a hurry to exchange rupees, otherwise their balance sheets in their currency would look bad. Such conversions cause more demand for foreign currencies. The foreign funds have been selling Indian shares and taking dollars back to America causing pressure on the rupee. India has recently decreased it imports, which brought its trade deficit down by US$1.5 billion from December 2008 to January 2009. Yet, both the trade deficit and budget deficit are high and are contributing to the fall of the rupee. In a nutshell, the supply of rupees has risen and its demand has fallen causing the rupee to fall against the dollar. Both the rupee and the US dollar have lost the value only that the rupee has lost a lot more. Whom does the falling rupee hurt? Indian students who are studying abroad will have to pay more to purchase the currency of the country in which they are studying. Their cost of education will go up as a result of the falling rupee. Indian tourists will find it expensive to travel abroad. Indian patients going overseas for medical problems will find the treatment expensive. Indian companies buying raw material, finished products, and spare parts from abroad will find it expensive to continue to do businesses with foreign companies. The foreign debt payments of both Indian government and Indian companies who have borrowed money from overseas banks will go up. What is the effect of the falling rupee? Inflation. The money supply (M3) increased from 40,06,722 crore to 45,90,189 crore rupees from March 31, 2008 to Feb 13, 2009 ' an increase of 5,83,467 crore rupees or 14.56 percent. Since the supply of rupees is greater than its relative demand, according to Milton Friedman, the coming of inflation will prove that it is always and everywhere a monetary phenomenon. Furthermore, RBI and banks have lowered the lending rate to accelerate the demand for loans and thereby pumping more rupees into the economy. Right now the good news is that India's inflation has dropped to 3 percent in February of 2009, and D.K.Joshi, an economist with Crisil Ltd., is predicating that it could reach to zero. Well, dream on! The inflation is a lagging indicator and is waiting just around the corner to go up. The decelerating economic growth, rising gold prices, rising cost of imported goods and services, and the falling rupee in the world market are sure signs of inflation to come. And if the economy fails to pick up, India may see a stagflation.